It is with heavy hearts that we here at the Gateway Region are writing to inform you of the passing of long-time Region Coordinator and Registrar, Donna Mayer. Donna worked for the Gateway Region for 22 years. To say that Donna has played a paramount role in the operations of the Region would be a huge understatement. Donna has become everyone's friend and many relied on her for handling most of their volleyball questions. She will be remembered for her kindness, patience, and love for the Gateway volleyball community. If you wish to send anything to express your condolences, please send it to the office and we will personally deliver to her home in order to respect the privacy of the Mayer family. VOLLEYBALL NATIONS LEAGUE TICKETS ON SALE: The U.S. Women’s National Volleyball Team will return to Lincoln, Nebraska, in 2018 as it hosts a four-team round-robin pod May 15-17 in the opening week of the new FIVB Volleyball Nations League (VNL). The U.S. Women will host Italy, Turkey and Poland. To purchase tickets for this event, click here. Iran, Poland and Serbia will join the U.S. Men’s National Team for three days of FIVB Volleyball Nations League matches on June 15-17, 2018 at the Sears Centre Arena in Hoffman Estates, Illinois. To purchase tickets for this event, click here. Check out Heather's keys to blocking middle success. Physical injuries are common in volleyball and all sports, but how do you recover from a mental injury? Superstars Carli Lloyd and Dustin Watten share their experiences and advice. Take control of your mental game. Written by USAV High Performance coach Chris Larson, this article discusses tools for making better shots at the net, making you a more creative and wily hitter. USA Volleyball is hosting selection camps ahead of the spring Beach National Qualifiers (BNQs). There are seven selection camps in total, two in April. Find out more. The new USA National Beach Tour is underway, as are Beach National Qualifiers. Moster blocks await on the beach ... sign up for the tour and the qualifiers. There are 12 indoor HP tryouts for girls across the country in the month of April, with cities including Philadelphia, Kansas City, Dallas, Minneapolis and more. There are also a handful of events left in March. Check the schedule, then register. Check out the roster for the 12-player U.S. Women's Collegiate National Team China Tour (CNT-China), comprised of current collegiate players who will train and compete in China from May 20-31. From our partners at SI Play and NCSA: Navigating through the recruiting process can be difficult. It's hard to know where it begins, what's expected of you, or even what your step-by-step game plan should be. Here are some beginner tips and tricks. You've just finished an exceptionally hard practice ... or maybe you won a five-set match. Either way, it's time to eat. But, what's your best choice for food to replenish what you've lost? Fill up on these proteins and carbs. The new SafeSport training course is now available in the USAV Academy. Coaches need to complete all three sections, which can be accessed through our training website. Direct questions to safesport.general@usav.org. Will USC three-peat, or will a new champion be crowned at this year's championship? BLOCK May 4-6 on your calendar and purchase your tickets to see the champions crowned in Gulf Shores, Ala.
Get tickets to great volleyball this spring and summer, including Girls '18s, GJNC and the new FIVB Volleyball Nations League. Legendary coaches Hugh McCutcheon, John Speraw and Karch Kiraly, and players Kim Hill and FIVB Best Server April Ross, give you keys to developing a serve that will baffle your opponents. Two-time Olympic silver medalist Lindsey Berg shares 10 tips that will help you make a difference on the court. Learn how you can build a rapport with your hitters by knowing their strengths and weaknesses. Are you interested in preparing for the High Performance pipeline? Here are tips on what HP coach evaluators are looking for in a potential national-level player. Yoga can help increase your flexibility and strength, improve balance and help prevent injuries. Olympian Kayla Barnwarth demonstrates the top five yoga poses for volleyball players. Take time out of your day for these exercises. USA Volleyball Beach National Team athlete Emily Day shows you seven useful foam rolling exercises. In a bonus move, she's throwing in two tennis ball exercises for your pecs and rhomboid. 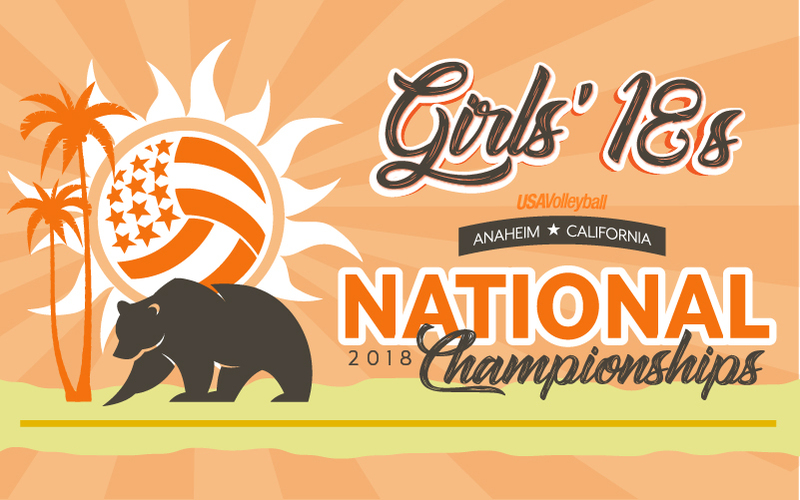 The third edition of the USA Volleyball Girls 18s Junior National Championships kicks off tomorrow in Anaheim. USAV will be on hand with live streaming, results, photos and more. Follow @USAVolleyball on Snapchat, Instagram Stories and Facebook Live for behind-the-scenes fun! Share your posts with us using #GJNC18. Live streaming begins Friday, including a two-hour practice by the U.S. Women's National Team on the championship court at 9 a.m. Pacific. Championship matches are on Sunday. USA Volleyball is hosting selection camps ahead of the spring Beach National Qualifiers (BNQs). There are two more camps in May. Find out more. Get evaluated for 2018 national beach programming at the Spring Open National Skills Assessment Camp in Playa Del Rey, Calif., May 18. The USA National Beach Tour is underway, as are Beach National Qualifiers. There is just one more Indoor HP tryout for girls on the schedule: this Sunday in Las Vegas. Check out boys' tryout results | Girls' results will be released May 7-24. USAV sets WNT Volleyball Nations League roster with Jordan, Rachael, Carli, Foluke, Kelsey and more. Who is representing Team USA on the CNT-Europe trip? Two dozen college athletes comprise the CNT-Detroit roster. From our partners at SI Play and NCSA: A major aspect of the recruiting process is understanding the importance of technology. Did you know that many coaches do their initial evaluation of recruits online? Get online or get in line! I see coconut water everywhere; it's all the rage! Are there benefits to drinking coconut water over regular water? Learn the pros and cons of this latest trend. Have you witnessed or experienced abuse? File a report. Get tickets to great volleyball this spring and summer.